Courtesy of Aaron Aloysius. See anyone you like? I try and view the Senior Bowl with an element of caution. I’d rather use the game and work outs to confirm suspicions rather than base opinions. A good example is Cameron Jordan (DE, California) – who really flashed a good overall skill set during the week and for me solidified a top-15 grade. Others like Phil Taylor (DT, Baylor) and Vincent Brown (WR, San Diego State) had good weeks but I need to try and find some tape to judge whether it’s a one-off. Simply put – some guys just look good in work outs but in the pressures of a big game can they repeat that performance? Are they motivated to impress when a job is on the line – and will that motivation disappear when the cheque’s are being cashed? The Senior Bowl itself is little more than an exhibition. It’s also an opportunity for those that haven’t been reporting on or following college football to make snap judgements. Adam Caplan from Fox Sports refers to Christian Ponder as a “strong armed passer”. Anyone who has watched Florida State the last two years will know that Ponder cannot list a strong arm amongst his positives. He was named the game’s MVP and appears to have impressed enough writers to get a thumbs up. The story is – he’s healthy again. There’s a massive assumption out there that the Seahawks are going back to a Holmgren-esque, purer west coast offense (they almost certainly aren’t) and I’ve seen Ponder linked with Seattle in more than one or two places. I wrote this article in October about Ponder. He isn’t capable of beating teams with his arm – even when he was healthy in 2009. It’s not just the lack of arm strength, it’s his completely erratic performances. You simply never know what you’re going to get from Ponder. He doesn’t have any direction on his deep throws, he’s not as good throwing on the run as some people will have you believe. Clearly he’s an intelligent guy off the field – but that unfortunately doesn’t translate to game day. I followed up with another article shortly after which explains my opinion on the Seminoles’ QB further. A good Senior Bowl has had little impact on my grade – I wouldn’t draft him in the first four rounds. I have him down as a long term back up at best in the NFL. I’m also not surprised to see a prospect like Colin Kaepernick (QB, Nevada) getting strong reviews. He should do well in a work-out environment – he’s tall, athletic and has a good arm. His mechanical issues are less exaggerated and he’s a personable guy so will impress the media during interviews. When I watched Nevada this year I saw Kaepernick as a mid/late round project. He just looked awkward throwing the ball. He’s got everything that Cam Newton has – size, running ability and production. However – there’s a substantial difference in the passing game. Newton is a much more fluid and developed passer and although people want to labour the point that he’ll need to adjust at the next level – he’s made pro throws, he’s made surprisingly good reads against top opponents and mechanically he’s almost there. Kaepernick has more to do to become a starter. Newton will make throws and put up numbers quickly as long as he can prove to scouts during interviews that he isn’t incapable of handling a pro playbook. Kaepernick will need a lot of work, possibly 2-3 years down the line, before I think he’ll be ready. I understand the talk about a second round grade. The athleticism will almost certainly interest a few teams and there are enough rosters minus a starting quarterback right now that I could see it happening. It’s a bit of a ‘your team’ situation though. I’d be intrigued to see how he pans out for as a second rounder, I just wouldn’t necessarily want my team to invest anything more than a round four or five flier in Kaepernick. What about the other quarterbacks? I saw nothing from Greg McElroy or Andy Dalton that made me question my largely negative judgement. Not starter material at the next level and late round picks at best for me. Ricky Stanzi actually performed below expectations which was a concern. Previously I had him down as possibly the 5th best QB prospect this year – that clearly isn’t the case now. Gabbert, Newton, Mallett and Locker have their own island. Kaepernick is on a raft near by. The rest are on a speedboat heading in the opposite direction. So what about Locker – the ‘big name’ of the Senior Bowl. It was as expected really – erratic decision making, poor accuracy mixed in with some nice plays particularly when he can get out of the pocket. People who came to Mobile prepared to draft Locker in round one won’t change their mind and neither will those who gave him a mid/late round grade. I still maintain though that somebody will draft the guy in round one – and I’ll be surprised if Mike Shanahan passes. Leonard Hankerson (WR, Miami) is someone I always ranked in the round 2-3 range and he had a good week overall to cement that grade. He’ll have a moderate ceiling in terms of draft stock because he isn’t an explosive player, but he’s big and makes plays so somebody will see value in that – it could be Seattle. I’m staying cautious on Vincent Brown (WR, SD State) as mentioned at the start of the post. Everything was a hands catch in work outs and when asked to run certain routes he could do it during practise. Then the game kicked off and he went into his shell a bit. He had some big games in 2010 (particularly against TCU) but also struggled slightly against Missouri and Colorado State. I’m looking for more tape on this guy to make a sufficient judgement. One prospect I’ve spoken a lot about on this blog is James Carpenter (LT, Alabama). When people have often suggested the limited Gabe Carimi (RT, Wisconsin) as a Seahawks option in round one – I’ve been quick to point to Carpenter as a superior (cheaper) alternative later in the draft. He stood out for the Crimson Tide this year and flew under the radar. Clearly he’s raw but he’s got a great frame that’s capable of adding size. He did a good job in Mobile and that will help his stock. I honestly would have no qualms drafting him in the round 3-4 range. In a few years time that might look like a steal. Brooks Reed (DE, Arizona) is another I’ve been high on for the Seahawks as a perfect LEO candidate. He’s got a great burst off the snap, he’s strong enough to stand up against the run and although he’s not an elite athlete – he’ll make up for it with consistent effort. While his stock is rising, Jeremy Beal (DE, Oklahoma) seems to be going in the other direction. I like that – because Beal is another LEO I’d happily draft. The position is designed for production and both prospects have the necessary skill set to warrant keeping an eye on. As with San Diego State’s Brown, I’m also working hard to find Baylor tape. This isn’t just to watch potential defensive line ‘do it all’ prospect Phil Taylor (who could project as a Red Bryant 5-tech, nose tackle or even 3-technique for Seattle), but also guard Danny Watkins. He’s got a limited ceiling due to his age – he’s only a few months younger than me so he’ll turn 27 during his rookie season. He flashed enough this week, however, to interest teams needing a mid-round fix among the interior offensive line. I can’t talk about senior guards without mentioning Rodney Hudson (OG, Florida State). Since early in 2009 I’ve been a fan and nothing has ever changed that. He played all week at 291lbs and looked every bit the top guard on the field during yesterday’s game. Clearly the size is an issue for any team not running a pure Alex Gibbs zone blocking scheme. Seattle are no longer running that, despite Gibbs’ fleeting role with the team last off season. Even so – I really believe Hudson is strong enough, wise enough and fully capable of having a long and successful NFL career. Nobody has his level of technique in this draft class. He makes up for a lack of weight by understanding what he needs to do to gain leverage and his second level blocking is a thing of beauty. Whether he plays at center or guard, I think the Seahawks have to consider him. Two other defensive prospects who impressed me were Pernell McPhee (DE, Miss. State) and Jarvis Jenkins (DT, Clemson). I could see both at five-technique in Seattle. Offensive lineman Derek Sherrod (OT, Miss. State) and Demarcus Love (OT, Arizona) were less impressive. I’m beginning to wonder if Sherrod’s long term future is at right tackle and whether Love needs to kick inside to guard for a man blocking scheme roster. Allen Bailey (DE, Miami) continues to look the business in pads but flat out disappoints whenever he takes the field. I’ll finish by admitting I’m still not even close to getting on the Von Miller (OLB, Texas A&M) bandwagon. He got a third round grade from the draft committee last year and I think that’s about right. Aside from the limited value of the 4-3 outside linebacker (where Von Miller will have to play in my opinion) – I just don’t see him being an effective force on running downs and I don’t think you’re going to get 8-10 sacks from him either. I have to represent draft ‘hype’ in my mocks because it does figure. He’ll be in my next first round mock draft for sure. However – I’m still completely unconvinced he’s worthy of that price. It’s absolutely true that the combine will make or break Von Miller’s rapid rise. If he runs a fast time, someone is going to fall in love with the agility and quicks and take him earlier than they should. If he runs in the 4.6-7 range, people will start to wonder if this is just a smaller prospect who can move around – but isn’t that elite guy who will compensate size for speed. And for me – the clear #1 senior prospect wasn’t working out in Mobile this week – Jimmy Smith (CB, Colorado). The Red Bryant position, the nose tackle, the three-technique and the LEO pass rusher – Seattle’s defensive line scheme is a bit more complex and a little less orthodox than most. To the eye it looks like a 4-3, but when you consider the roles of each lineman and the strict qualities needed at each position – it could probably be defined as being closer to a 3-4. We’ve had a year to look at it and using the 2010 season as a basis for my opinion – I’ve come to a few conclusions. I think the Seahawks will consistently find LEO rushers without spending the top picks. It looks – to me at least – a position designed for production. There’s an emphasis on speed, you put the DE in space and hope to put him in one-on-one situations. Both Chris Clemons and Raheem Brock had double-digit sacks in 2010 despite middling careers before arriving in Seattle. Given the opportunity to draft an elite prospect in the Demarcus Ware mould, I’m sure the Seahawks would jump at the chance. However, I do suspect it’ll have that ‘plug in and play’ quality to it and that may decrease the likelihood we’ll see a first round pick at the position except in rare circumstances. In the 2011 class I see only three likely candidates that fit the role. Robert Quinn (DE, Carolina) has the size and initial burst – but he’s also strong and capable against the run. I’m a big fan of Aldon Smith’s (DE, Missouri) first step and ability to get round the edge. Justin Houston (DE, Georgia) screamed LEO pass rusher when I watched the Bulldogs against Florida. Of the three, I suspect only Justin Houston will be available when the Seahawks are scheduled to pick 25th overall. For those wondering about Von Miller (LB, Texas A&M) – even for a position that values speed and not size, he’s too small at 237lbs and will get flushed out against the run. He’s strictly a linebacker prospect in the Seahawks scheme. The Seahawks found production at the LEO trading Darryl Tapp for Clemons and a fourth round pick. They grabbed Brock as a free agent. Prospects such as Ricky Elmore (DE, Arizona), Cliff Matthews (DE, South Carolina), Brooks Reed (DE, Arizona), Jabal Sheard (DE, Pittsburgh) and Jeremy Beal (DE, Oklahoma) are clear options outside of round one and may be more likely in 2011. Part of the LEO’s production is down to the other three defensive lineman. The Red Bryant ‘five technique’, the nose tackle and the three technique need to take up blocks to create the edge one-on-one match ups. It also carries significance against the run, with the right end being a lighter player – you need size among the interior. Losing Red Bryant had an instant impact on the Seahawks. At 6-4 and 333lbs he’s about 30lbs bigger than the average five technique. His main duty appeared to be setting an edge against the run, essentially making a front-three with the interior lineman and offering some pass rush qualities (Bryant flashed an unexpected quality in this area before his injury). I don’t expect the Seahawks to move away from that too much. We can look at traditional five-techniques and be fooled into thinking they ‘fit’ this Seattle defensive scheme purely due to position name. That isn’t strictly true – any candidate will either need the size that Bryant has or an ability to offer similar qualities (ability to move inside, stout against the run). I can see the Seahawks compensating on the size to draft a guy who offers a better pass rush – but they’d still need to play above their size. Cameron Jordan (DE, California) would be ideal in that sense. He’s playing at about 285lbs which is considerably smaller than Bryant. However, he’s strong enough in the upper body and wise enough with his angles to make up for the 50lbs drop. His ability as a pass rusher would be a major upgrade over Bryant’s. As a partnership you could get flexible – moving Bryant inside sometimes on passing downs, disguising defensive calls and spelling Bryant with Jordan to get more out of both prospects. The only problem is – Jordan’s stock has never been higher. A lot of blogs (this one included) have graded Jordan in the top 10-15 for a good few weeks. He flew under the radar until the Senior Bowl – where he exploded onto the scene. He will not last anywhere near the #25 pick now the secret is out. What about alternatives in round one? Muhammad Wilkerson is a fast riser who’s moving up many boards. He’s played end and tackle for Temple this year and recording ten sacks has boosted him possibly into top-20 consideration. There’s a fair chance he could last until the #25 pick and like Jordan – he offers that flexibility to play more than one position. He’s playing at around 305lbs, which is still smaller than Bryant but a step up from the California prospect. The likes of JJ Watt, Cameron Heyward and Adrian Clayborn are capable orthodox five techniques for 3-4 teams, but the Seahawks scheme is anything but orthodox. I wouldn’t consider any likely options for the Seahawks. Watt and Heyward are not big enough. In particular I’m a big fan of Watt (not so much Heyward) but I can’t see them in this scheme. Clayborn is perhaps more likely due to his pass rushing qualities, but he’s better as a power end in the 4-3 or a pure five technique. Depth at the position is crucial and I’m not sure the Seahawks will rely on Kentwan Balmer like they did in 2010. Christian Ballard (DT, Iowa), Jarvis Jenkins (DT, Clemson), Lawrence Guy (DT, Arizona State) and Terrell McClain (DT, USF) are possible transition options ala Bryant outsie of the first round. In my latest mock draft I touted the possibility that the Seahawks could draft a nose tackle. In the right scheme, a good nose tackle can define a defense. While the Seahawks don’t run a pure 3-4 defense, I certainly believe a stud NT can make a huge difference. If he can be a dominating run stuffer and consistently carry two blockers – that’ll free up the LEO and three technique to get into the backfield. The team felt the departure of Colin Cole through injury and struggled losing his size inside. With Bryant and Brandon Mebane also missing time – the team lacked quality size depth along the interior. The result was a disjointed run defense – a contrast to the team’s early success there. Phil Taylor (DT, Baylor) is clearly the top prospect in that nose role. He’s 337lbs and carries it like a guy 30lbs lighter. He has the size to play the NT, but also the mobility and agility to maybe even play some three and five technique. Long term – he could even be an upgrade for Bryant. Both could spell each other, mixing up the two roles. The issue of course with a guy that size is that he may only play 25-30 snaps a game. Can you really add a first round pick who plays so little? You can when you’re not picking in the top ten. If said prospect creates a lot of third and long situations, likewise it’s worth the investment. Pete Carroll has stressed depthon bothlines is a priority. If the defensive line needs depth at any position – this may be the answer. There aren’t a cluster of alternatives to Taylor – Kenrick Ellis (DT, Hampton) and Jerrell Powe(DT, Ole Miss) are both slated in the mid/late round range and will interest 3-4 teams. If the Baylor prospect is there in round one, it could be tough to pass. The final position to look at is the three-technique. Brandon Mebane is a free agent, so we’ll have to monitor that situation – not easy given the CBA situation. I actually believe Mebane is better in the one-technique role or nose tackle – and losing weight to play at the three hasn’t had the expected impact. It’s a stretch to expect he’ll be asked to re-gain lost weight – but again it’s something the team may consider. Nick Fairley and Marcell Dareus are likely top ten picks, but Corey Liuget (DT, Illinois) isn’t too far behind and has the perfect frame and skill set for Seattle’s three technique role. I’ve mocked him to the Seahawks recently and he’s an option depending on Mebane’s situation. I’m not convinced the team keeps Mebaneand drafts for depth there in round one. Again it may be an area targetted later in the draft. Carroll will know all about Jurrell Casey (DT, USC). Drake Nevis (DT, LSU) is a three-technique but at 290lbs may be considered a bit light inside – without having the necessary height/size to play the five technique. I can see Nevis on a team like Indianapolis that values nimble lineman. Stephen Paea (DT, Oregon State) similarly has that Nevis-like size, but actually his strengths come against the run. He’d be a good nose tackle for the Colts, but perhaps a better fit at five-technique for Seattle. It’s still a slightly awkward fit. Overall the depth on the defensive line makes it a realistic proposition with the #25 overall pick. Defining which positions carry the value to warrant the selection and determining the areas Seattle will target remains a work in progress. Von Miller a top-five pick? Really? Surely not? The Senior Bowl is a fantastic opportunity for the top senior prospects to showcase their skills, put their name on the map and improve their draft stock. It’s also an opportunity for snap judgements and an awful lot of unnecessary hype. This isn’t likely Schefter’s opinion rather information he’s received from people watching work outs and from inside the NFL. I suspect it’s hyperbole. Miller is a guy I’ve been watching for two years now. After a 17-sack season in 2009 it seemed likely he’d declare for the subsequent draft. Then he received a third-round grade from the draft committee and returned to Texas A&M for his senior year. At no point in watching tape of Miller did I think he looked like a top-five pick. Here’s what I saw: excellent speed used to consistently exploit college opponents by rushing the edge. The huge production is emphasis on that and his skills in coverage gradually kept improving. At the same time I saw only a marginal first round prospect. He’s about 238lbs and it showed sometimes when he took on big offensive lineman. I’m not even talking about elite athletes at the position – just big bodied guys who could just use their size and strength to knock him out of the play. In the NFL, he’s not going to be able to rely on edge speed over and over again. The big guys will also be elite athletes, capable of restricting his edge speed and dominating him due to size. He can’t play defensive end or LEO because teams will target him again and again against the run. Miller will just get washed out and become a liability. Can he play outside linebacker in the 3-4? Maybe – because playing in space will allow him to pick his gap and use the speed to rush the passer. He’s no slouch in coverage – but again he’s a bit of a one-trick pony. It’s all about his nimble frame and speed which is fine in college, but won’t be in the NFL. For me his best fit is at OLB in the 4-3, but even then he’s under sized and will need to adapt to that position. He’s about 12lbs lighter than draft bust Aaron Maybin (taken 11th overall by Buffalo) who has struggled to have any impact at all because he can’t rely on speed and quicks alone at the next level. The hype surrounding Von Miller sums up the issue I have with the Senior Bowl. Tape is generally pushed aside while we watch guys work out in unnatural situations. A bit of talk about a prospect performing well suddenly leads to a power surge. It’s a similar situation for Colin Kaepernick (QB, Nevada). Suddenly he’s a second round pick because he’s flashed a strong arm this week. Suspect mechanics are seemingly ignored because the guy can throw it downfield under no pressure. Titus Young (WR, Boise State) apparently hugged Mike Mayock today because of a positive review on the NFL Network which has boosted his stock. Some prospects will thrive in isolated work outs and walkthroughs. While you need to be prepared to be impressed and possibly proven wrong – I just don’t think you can beat watching game tape. When I watched the tape – I saw a lot to like about Von Miller, but also a lot of concerns about how he translates to the next level. I wouldn’t roll the dice on an under sized project 4-3 linebacker in round one. Can Von Miller be a top 10-15 pick? Sure – why not? That kind of pick has been made before. It’d be a huge mistake in my opinion though. I’m also willing to be proven wrong, so we’ll see how it works out. Regular visitors to the blog will know how highly I rate Colorado cornerback Jimmy Smith. He’s been a weekly feature among the top-ten picks in my mock drafts. It seems like maybe he’s finally going to get the recognition he deserves on a national level. There are two new mocks to run through this week. As we’re in the thick of the Senior Bowl – I’ve made a new projection (click here to view) to represent some of the events happening in Mobile. I will come on to the changes in a few moments time. Guest blogger Glen Peer has also conducted a mock draft, which is also added to this post (see below). As always – my intention is never to present these mocks to you as a defining attempt to guess what will happen on April 28th. These are merely discussion starters and a way to represent options for the Seahawks, the other high profile picks and see which prospects are rising or falling. For the first time I am mocking Phil Taylor (DT, Baylor) to the Seahawks at #25. He’s impressed in Mobile this week mainly due to his mobility at 337lbs. Really he’s a huge, immovable object of a nose tackle. The fact he’s not a complete statue as well could easily see him settle into a home among the first round picks. There are some concerns – firstly, he started his career at Penn State but was essentially thrown off the team. He’s re-launched his career at Baylor with some success. The Seahawks haven’t been afraid under Pete Carroll and John Schneider to take on a reformed character with the right talent. Secondly – is he capable of playing any more than 25-30 snaps at that weight? If not, can he be enough of a force on first and second down to justify the investment? It’d be easier for a Pittsburgh or Baltimore to make that choice having secured a lot of other positions and owning talented defenses already. Can the Seahawks afford that move? You could also ask – do they have a choice? They won’t be flush with alternatives at #25 and the general depth among interior defensive lineman makes it a legitimate option in the late first round. If Pete Carroll really is satisfied with ‘depth’ along both lines, the #25 pick isn’t a bad place to find it. Muhammard Wilkerson (DE, Temple) is an alternative flexible option who can play the five technique or move inside on passing downs. However – in this hybrid 4-3 scheme that uses a LEO ‘specialist’ and a larger 5-technique, it almost stresses the importance of the nose tackle as much as any 3-4 does. If you want to create 1-on-1 match ups for your LEO rusher, you need the interior to take up blocks. If you want to dominate against the run, again the nose has to clog the middle allowing your 5-tech and outside linebacker to beat the edge. Taylor has shown in Mobile he’s adept at carrying two blockers. The nose tackle can become a defensive MVP for the right team. I suspect there will always be a ‘plug-in-and-play’ quality to the LEO role, but that won’t necessarily be the case at the NT. Losing Colin Cole had a surprisingly adverse affect on the team – even if Cole is no more than a middling player. Getting good – possibly great – at nose tackle can set this defensive line up for years to come. It has to be a consideration if the Seahawks stay at #25. To see Rob’s full first round mock draft click here. In my first mock I have the Seahawks taking University of Miami DE Allen Bailey with the 25th pick. It is a name that has not been discussed much amongst the top DE’s in this years draft but in my opinion is a very interesting prospect to look at, more on him in a minute. I also want to be very open that I placed a few stretches, at least in my opinion, not necessarily because I truly believe that the draft will roll out that way, but because it should generate some good discussion. Also as we saw with Jacksonville (Tyson Alualu) and the Eagles (trading up for Brandon Graham instead of Earl Thomas) surprises will happen in rd 1. We should all remember that until the combine, and pro days when coaches, and personnel staff can talk to every prospect they want to it is going to be extremely difficult to project where players will be selected. Not to mention that if a CBA is agreed upon before the draft and a free agency period takes place that will change things even more. – A ‘tweener DE/DT. Good size for power-DE position but could also fit well as a 3-technique in a Tampa 2 scheme. Has adequate top-end speed for his size. – Good initial quickness. At his best using inside pass rush moves or bull rush. Shows an effective swim move. Has very good combination of size, quickness and power but lacks the top-end speed to consistently turn the corner as an edge rusher. – Fires out of his stance low and generally plays with good leverage. Shows good strength at the point of attack. Will fight through double team. Does a nice job of using hands and power to stand up the offensive lineman while looking for the ball. Has the size and anchor to hold his ground when teams run at him. Strong tackler for his size. A striker with good power at the point of attack. Shows the ability to jar the ball loose. For his career in 38 games Bailey registered 103 tackles, 30 tackles for a loss, 19 sacks, and 2 forced fumbles. I choose Bailey over some other options on the defensive line such as JJ Watt, Cameron Heyward, Corey Liuget, and Stephen Paea to point out another option for the Seahawks and his similar size and skills to Raheem Brock. Also what fun would it be if Rob and I selected the same player for the Seahawks this early in the process . – New regimes mean new QBs. However, with Andrew Luck heading back to Stanford, and no clear cut #1 QB prospect as of today, adding a talent like AJ Greene across from Steve Smith makes the most sense this early in the evaluation process. Blaine Gabbert, Cam Newton, Nick Fairley, & Da’Quan Bowers will vie for this position until one separates from the pack. The combine, pro days, and private workouts will be closely monitored leading up to draft day. – With Fairley and a healthy Elvis Dummervill would instantly upgrade the Broncos defensive front. Da’Quan Bowers similarity in athleticism to Julius Peppers will make John Fox think long and hard about taking him here (Fox took Peppers #2 overall in 2002) but GM Brian Xanders, and team President John Elway will also have a say. – 2nd year head coach Chan Gailey committed to Ryan Fitzpatrick being the starter next season, and that may or may not happen based on how the underclass QBs show prior to the draft in interviews and pro days. Right now Dareus fills a big need on the defensive line. – Carson Palmers wants a trade, and Mike Brown says its not happening. The same thing happened to Brown with Boomer Esiason who also wanted a trade. Brown kept Esiason, drafted Dave Kingler with the #6 overall picked and traded Esiason the following year. – Certainly the Cardinals need to address their QB situation, and I think they will…just not via the draft. Ken Weisenhunt will be on the hot seating next season, and in my opinion, will fight for his job with a veteran QB, opposed to a rookie signal caller. Bowers adds another pass rush threat to go along side Darnell Dockett, and Calais Campbell. – In my first proposed scenario I don’t think the Browns could pass on Peterson. A chance to pair Peterson and 2nd year CB Joe Haden for at least the next 5 years presents serious problems for the rest of the AFC North. However, they may not want to allocate that much money to one position and look to address WR or trade down. – Jim Harbaugh will need to address the QB position, and make take a shot with Cam Newton, or Jake Locker but I don’t see their skill sets fitting with how Harbaugh runs his offense. With Nate Clements possibly on the outs in San Fransisco due to his contract, and diminishing skills Amukamura will compete to be the opening day starter opposite Shawnte Spencer. – Many had Quinn as a top 5 prospect heading into 2010. Not having played football for a year due to his suspension may cause him to fall. At this pick the Titans can pick up another young pass rusher to pair with 2nd DE Derrick Morgan whom the Titans drafted last year. The combine, pro days and interview process will be very important for Quinn. – I don’t think there are many people that believe the talent on the Cowboys roster warrants a pick this high, so they are in a position to take the best player available, or trade down. Early word from the senior bowl has been that Jordan has been dominating in practice. Combined with a great personality Jordan could rise further over the next few months. – Mike Shannahan needs to figure out the QB position after the Donovon McNabb debacle. Newton fits the Shannahan mold of mobile with big arm. Many speculate that Jake Locker will be in play and that may very well be true but his inconsistency gives Newton the leg up right now and that. – Wade Phillips is bringing the 3-4 to the Houston. Miller should provide the pass rush threat off the edge, but also has the ability to drop into coverage effectivly. Phillips will need to find a big nose tackle but can look to Free Agency (whenever that happens) to address that. Getting a play maker like Julio Jones opposite Andre Johnson could be addressed here or later rounds. Getting the right guys to play a new scheme seems a little more important early though. – Character, and off field issues will ultimately determine where Ryan Mallett is drafted, however his skills can not be overlooked. He can make all the throws, and shown improvement in his decision making, and accuracy this year. – Matthew Stafford has taken a beating in his 1st 2 seasons as the Lions QB. The Lions need to protect the future of their franchise, or all the steps they’ve made in rebuilding will be for not if they can not keep him healthy. This years OT population is good, but not great and right now Carimi holds the edge on other options such as Nate Solder, Tyron Smith, and Derrek Sherrod. – Sam Bradford needs weapons. Jones gives Bradford, and new OC Josh McDaniels, a go-to type WR to pair with deep threat Donny Avery who will becoming back off knee surgery. – Both Ronnie Brown, and Ricky Williams contracts are up. The interior offensive line did not help the run game at all in 2010 so that maybe a viable option with prospects like Rodney Hudson, or Mike Pouncey still on the board. Ingram gives the Dolphins run game a shot of youth, and although he had a down season in 2010 should still be productive runner on Sundays. – In a division with Peyton Manning, and Matt Schaub you can never have too many pass rushers or cornerbacks. JJ Watt, Adrian Clayborn, or Aldon Smith at the DE position will also be in play at this pick. Harris struggled in his bowl game, but otherwise had a standout year at Miami. – Tom Brady has 2 big targets, but they’re both tight ends. Baldwin would give Brady the big target outside that will help stretch the field and open up underneath for Wes Welker. This is early for Baldwin, but by not taking account of trades, I see this as a possibility if there are no top tier prospects at their position left for Belicheck. – Clayborn had a down year for the Hawkeyes but would have an impact on the end for the Chargers 3-4. – The Giants are old on the offensive line. William Betty has not been answer they thought he would be when the drafted him 2 years ago. – Putting Smith on the end of Brian Price, and Gerald McCoy could be the start of something special in Tampa Bay on the defensive side of the ball. Interior offensive line may also be an option with prospects like Hudson, Pouncey, and Stefen Wisniewski still on the board. – Houston is moving up the draft board after his performance against Florida in the Sun Bowl. Getting another pass rush threat along side Tamba Hali should be an area of focus for the Chiefs this off season. – With Peyton Manning preparing to break the record for highest paid player sometime in the next month and a half it would be wise to protect that investment. – Many of the deficiencies in the Eagles offensive line were covered by Mike Vick’s ability to escape pressure. However, down the strech Vick took a serious beating and the wear and tear was visible. Offensive line has to be the greatest area of need for the Eagles. – It was very apparent that the Saints have issues at safety in their loss to the Seahawks on Wildcard weekend without Mike Jenkins healthy. The Saints are currently in a position to take a safety here, even while there are talented defensive tackles like Corey Liuget, and Stephen Paea on the board. – Pete Carroll’s message at his end of season press conference was we need to get better, and deeper up front…on both sides of the ball. Outside of Left Tackle on the offensive line those needs can be more easily filled in later rounds, and via free agency. Going with a guy like Bailey or Paea, or Liuget here makes sense. – Watt had a terrific season. A high motor player that can play the run and get after the quarterback will benefit from the surrounding talent in the Ravens defensive front. – Tony Gonzalez says he’ll be back for one more year. The Falcons could use this pick for his future replacement, or on another WR to pair up opposite Roddy White. The former seems like a smarter choice with the top end WRs off the board. – The Patriots will probably trade one of their 1st round picks for more picks next year. Logan Mankins should be a free agent when the CBA issue is cleared up, and the contract dispute that held him out of 7 games may make it difficult to resign him. Pouncey could step in as a replacement and is solid value at this pick. – Jay Cutler was sacked 10 times against the Giants, and over 5 times in at least 2 other games (Seahawks week 6, and Packers week 17). It did seem as the line got better as the season wore on but adding young talent to an older line makes sense. – The Jets offensive line seemed to take a step back with the loss of Alan Faneca. Unless the Jets front office is 100% confident that Vlad Ducasse will step in next season and start this is one direction the Jets could go. – Liuget is being mocked much higher than I have him and would be outstanding value at this pick for the Packers. He would add size, and talent to an already dominate front 7 in Green Bay. – Heyward didn’t have a great season, but had an outstanding National Championship game. At this pick the Steelers could take a player with a lot of upside and allow him to grow into a big time player, similar to Ziggy Hood who was drafted 2 years ago, and now plays a huge role replacing the oft injured Aaron Smith. Cameron Jordan (DE, Cal) is fast becoming the star of the Senior Bowl. He’s flashing a great pass rush repetoire to add to excellent physical qualities. Jordan is by far the top five-technique prospect, but I’m not sure 4-3 teams will be put off drafting him either. I wonder if this week will put him into the top-1o pick range – something we’ve been talking about throughout 2010? Reports suggest Jake Locker (QB, Washington) is still having a few issues with accuracy. It’s possible to blow this out of proportion – it’d be more of a concern if the tape showed anything different to what we’re seeing in Mobile. Locker will come out of this Senior Bowl in the same position he arrived – some will love his physical potential and therefore be willing to draft him as early as the top ten. Others will run a mile. Kris O’Dowd (C, USC) is struggling and it’s not a huge surprise. Despite a lot of gradings even as high as the second round – his stock was based on being well known rather than actual performance. Wes Bunting from the NFP sums it up in this tweet. It looked obvious to me ever since the Oklahoma game that Florida State’s Christian Ponder was a mid/late round prospect at best. Some high profile draft pundits kept him in the 1/2 round range despite no evidence to suggest this was possible. 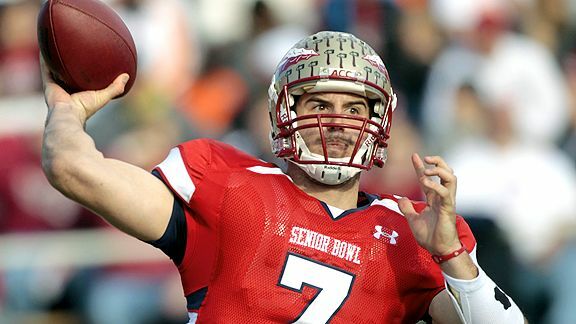 Events like the Senior Bowl focus minds and that’s happening again with Ponder. He’s not showing a good arm and his accuracy is all over the place. Not good news for Stephen Paea (DT, Oregon State) – he needs surgery on a knee injury and is out of the combine. It’s unclear how long he’ll be out for. Walter Cherepinsky has a daily stock report at Walterfootball. Jake Locker spoke to the NFL Newtork on his Senior Bowl experience. It’s day one of the Senior Bowl and for once, it appears to be well attended by most of the big name prospects. While Adrian Clayborne (DE, Iowa) isn’t in Mobile – the likes of Jake Locker, Ryan Kerrigan and Von Miller have shown up to work out for scouts. Rodney Hudson (OG, Florida State) is one of my favorite prospects in the 2011 draft. It was good to see him listed at 6-2 and 291lbs. Although a lot of teams will be put off by the sub-300lbs size, he’s still a perfect option for any team running the zone blocking scheme. He looked broad with room to add more weight. Top-25 talent without top-25 size. Von Miller (LB, Texas A&M) came in at 6-2 and 237lbs. He’s going to play outside linebacker in either scheme for me and isn’t an option for Seattle unless they’re looking for a strong-side outside linebacker. Jeremy Beal (DE, Oklahoma) could be LEO option though – he came in at 6-2 and 268lbs. You’d prefer he was a little taller, but he’s a mid-round option for the Seahawks. DeMarco Murray (RB, Oklahoma) will also provide good value as a runner and pass catcher. He had nice size at 6-0 and 216lbs. Stephen Paea (DT, Oregon State) only weighed 291lbs at 6-1. It’s not good news if you want him in Seattle – his strength is against the run but can you draft a nose tackle with that build? Can he translate to the 5-technique? Ryan Kerrigan (DE, Purdue) isn’t a stunning athlete, but he’s relentless and looks the part at 6-4 and 255lbs. He’s a LEO possibility and will interest 3-4 teams at OLB. Phil Taylor (DT, Baylor) may be one to watch this week. He’s the top rated nose tackle at 6-3 and 337lbs. As more information comes in from Mobile I’ll update this post. Stay tuned. ** One of my favorite under rated prospects in the draft is Alabama offensive lineman James Carpenter. He’s a JUCO transfer who performed well at left tackle in 2010. He’s been working out at left guard today for scouts. He’s a mid/late round steal waiting to happen and really flexible. ** Cameron Jordan (DE, California) deserves credit for showing up in Mobile. He’s already making plays in day one and standing out. If you’re looking for a riser over the next few weeks who can break into the top-ten – this is your guy. Tony Pauline has reports on every single prospects performance on day one, including weigh-in numbers. The Draft Insider website is essential viewing at the moment. Universally though it appears Cameron Jordan (DE, California) is lighting up Mobile. This isn’t a surprise and something we’ve been touting throughout the 2010 season. His ability to fit both schemes will help make him a top 10-15 pick. The NFL Network has Senior Bowl Day One highlights. Mike Mayock and Charles Davis take a look at the North team quarterbacks. Senior Bowl week is here and I’ll be tracking events in Mobile up until Saturday’s game. Of course it was also the East/West Shrine game on Saturday and a chance for prospects to put their name on map following a week of practises in Florida. Probably the best special teams player available in this draft is Iowa punter Ryan Donahue. He was clearly the best punter in college football the last two years, combining accuracy with a strong leg and decent hang time. He was again impressive during the shrine work outs and he should get drafted and provide one team with a solid long term roster-filler. Rob Rang lists his ten players who did the most to help their stock during work outs. Sports Illustrated has a photo gallery and review of the prospects participating in Orlando last week. TFY Draft Insider reports Cameron Heyward (DE, Ohio State) had elbow surgery this week. I was never that high on Heyward and felt he was generally over rated – but this may have a small impact on his stock anyway. TFY also lists all 56-players granted eligibility for the 2011 NFL Draft. Looking ahead to the Senior Bowl – Adrian Clayborn (DE, Iowa) will not participate and has been replaced by South Carolina’s Cliff Matthews (a LEO candidate in Seattle). Unsurprisingly the ever-injured Christian Ponder (QB, Florida State) isn’t healthy and won’t attend. Nathan Enderle (QB, Idaho) will work out instead after a solid week at the Shrine practises. ***Update*** – it now appears Ponder has arrived in Mobile after a U-turn. Charles Davis publishes the rest of his first round mock draft for NFL.com. He has the Seahawks taking Stephen Paea (DT, Oregon) with the #25 pick. In terms of scheme, I’m not sure how Paea would fit. He’s not an ideal fit at the one-technique given his lack of pure size, but can he translate to the Red Bryant position? Mike Mayock lists his ‘top fives’ at each position with some interesting choices. He isn’t high on Robert Quinn (DE, UNC) and he doesn’t even name five corner prospects.